Jose's Art Journal: Friends and Quotes. 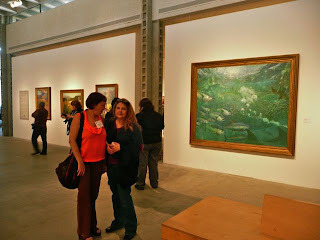 I met a few very good artists at a show in the Municipal Art Gallery of Los Angeles. The show was "Saving Paradise. The Symbiosis Between Landscape Painting and Environmental Awareness." A mouthful. 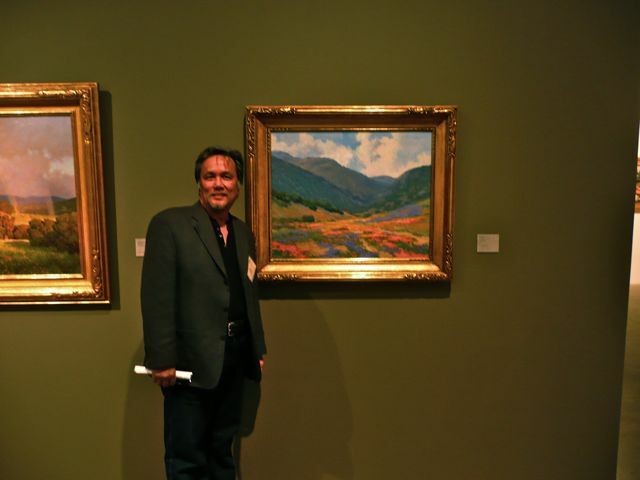 Organized by the California Art Club and curated by Jean Stern of the Irvine Museum of Art. I met again with one artist I admire. Junn Roca. Almost invariably I tell him how much I admire not only his beautiful work but the fact that he transitioned form a job in animation (painting backgrounds fro Nickelodeon) to a career in fine art. With two kids in tow and a mortgage, Junn, who is also a Filipino immigrant, decided to pursue his dreams of being a full time artist. It wasn't easy. He almost faced foreclosure, not to mention the pressure o two college-bound kids. His wife Frannie wins the award for supportive spouse in my book. 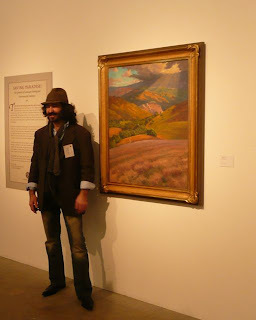 Junn Roca in front of his "Tejon Ranch" piece. Friends invariably tell me that at least I have good benefits through my job . It is true. I like my job also. I don't think I have the nerve to do what Junn did. Even with no kids or a mortgage. (Because I have no kids or a mortgage?) . I told Junn I really wouldn't want my tombstone to read "He had good benefits" however. Then again the jury is out on whether I'll get to that tombstone earlier rather than later without the medical insurance. I might not afford the darn thing anyway. I think artists have an arsenal of quotes they draw from when it comes to facing one's fears and doubts. Invariably , many of them highlight the paradox of leading a safe life instead of connecting with the groove of your heart. I like the funny ones. "Many are ready to suffer for their art but only a few are ready to learn how to draw." For good conversation, plenty of fun, quotes and rebellion, my friend Molly Lipsher is another staple. I always tell her that doing art "keeps her off the streets". She is feisty and incredibly talented with her pastels. I am so happy I get to see her from time to time. Here she is in front of a beautiful piece by David Gallup with the lovely and talented Debra Holladay . Molly Lipsher (in orange) and Debra Holladay with the luxuriant hair. And here a picture of the boisterous Alexey Steele just for fun. Talking about quotes, I recently read The Art Spirit " by the wonderful Robert Henri. That book is nothing but printed encouragement and good advice. "Don't worry about your originality. You couldn't get rid of it even if you wanted to. It will stick to you and show up for better or worse in spite of all you or anyone else can do." Amen. Funny, "Many are ready to suffer for their art but only a few are ready to learn how to draw." Helen Keller and Joseph Campbell quotes are easier said than done and sadly too many tend toward the following Sinclair Lewis quote. Ha... I guess I missed that Henri quote... I love it!! Jose, I love your work whether you chose to do it "on the side" or full time. It is beautiful. We do what we do because we are choosing what is most important. Love you... love your work. Hope to see you at the demo on Tuesday.
" Remembering that I'll be dead soon is the most important tool I've ever encountered to help me make the big choices in life. Because almost everything — all external expectations, all pride, all fear of embarrassment or failure — these things just fall away in the face of death, leaving only what is truly important. Remembering that you are going to die is the best way I know to avoid the trap of thinking you have something to lose. You are already naked. There is no reason not to follow your heart."